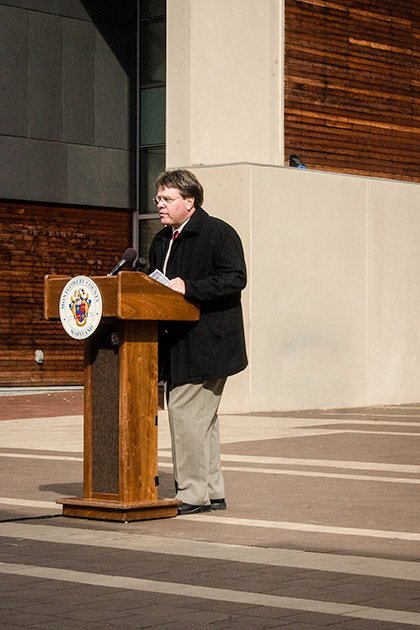 This Sunday marks the one year anniversary of the unveiling of “Tribute to our Veterans” located at Veterans Plaza in downtown Silver Spring. This memorial was created to honor the brave men and women who have served in times of war and peace. 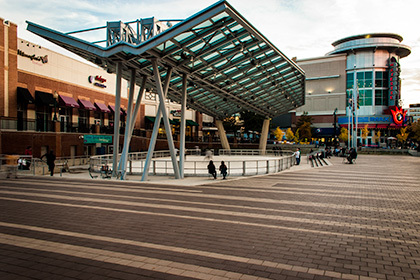 The design of the plaza was created by Machado & Silvetti Architects with Richard Burk Associates, Inc. and constructed by Costello Construction of Maryland. The memorial was commissioned to sculptor Tobias “Toby” Mendez who’s notable installations include bas reliefs at the United States Navy Memorial; a statue of Danny Thomas with three children at St. Jude Children’s Research Hospital; and bronze sculptures of famous Boston Red Sox players at Fenway Park. 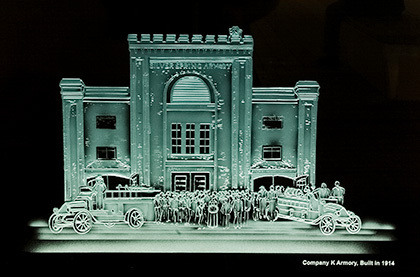 Finally, Classic Glass, Inc. was chosen to create three carved glass panels to rest atop Mendez’s bronze relief sculpture. Three separate installations pay homage to veterans and historic landmarks, one representing Montgomery County, one depicting the State of Maryland, and the other honoring veterans nationwide. Each glass panel contains poignant reproductions of letters penned by veterans from various branches of the military. The letters were generously provided by Andrew Carroll and The Legacy Project collection as the were originally written, including any errors. In addition to the letters, all seven uniformed service branches are represented including the Army, Navy, Air Force, Marine Corps, Coast Guard, Public Health Service Commissioned Corps and the National Oceanic and Atmospheric Administration Commissioned Corps. The glass panels are mounted to bronze relief bases that pay tribute to the five branches of the military, the honor guards from each service branch and the changing of the guard at Arlington National Cemetery. Additionally, the bases depict scenes of well-known battlefields and other historical landmarks. To honor veterans throughout the country, the national panel presents letters from the Revolutionary War, the Civil War, World War I, World War II, the Vietnam War, the Gulf War and the Bosnian Conflict. Also included is a moving passage from Abraham Lincoln’s Gettysburg address, “… we take increased devotion to that cause for which they gave the last full measure of devotion… that this nation, under God, shall have a new birth of freedom…” The bronze sculptures include the American flag, which is framed by two reliefs – one representing airplanes cued up for take off and the other depicting sailors marching up a gangway . The changing of the guard at Arlington National Cemetery is depicted to the left and the far right depicts the Coast Guard Honor Guard. 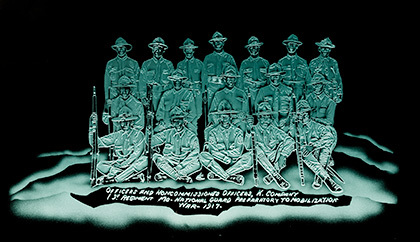 Featuring etched, shaded and carved glass images of local importance, the Montgomery County panel includes pictures of two military personnel, Company K from World War I and the two former Silver Spring armories. Classic Glass artisan Rudi Waros meticulously illustrated the provided photographs in preparation for the etching process and then sculpted the images in exacting detail. 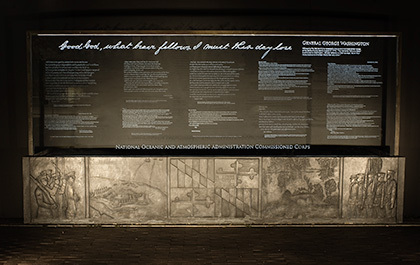 The letters included on this panel were sent home by veterans during World War II and provide the viewer a window into Montgomery County’s past. A particular highlight is a letter from General Schwarzkopf to an active duty nurse and recent widow of a fallen soldier from the first Gulf War. The General applauds the young woman for her continued perseverance in the Army, despite her tragic loss, he goes on to state that she is the epitome of selfless service. 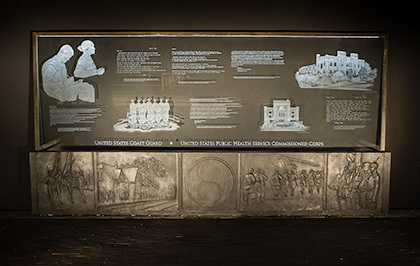 The bas reliefs include bronzes honoring the 29th Infantry Division; the Silver Spring train station that transported troops to and from the war effort during World War II; modern military personal heading to war; the Army Honor Guard wearing the shoulder patch and flash of Walter Reed; and the Marine Corps Honor Guard marching. A quote from General George Washington “Good God what brave fellows I must this day lose,” introduces this panel in honor of Maryland’s veterans. 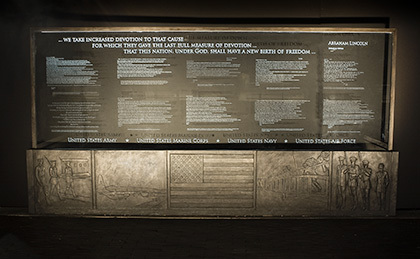 The letters on this panel are from the veterans of the Revolutionary War, the Civil War, World War I and II and the Vietnam War. The bronze sculptures include the Maryland flag, the only state flag that was originally carried as the colors of a regiment; images of two locations where major conflicts took place: Maryland, Ft. Mc Henry (War of 1812) and Burnside Bridge (Battle of Antietam); the Navy Honor Guard at the Naval Academy; and the Airforce Honor Guard. 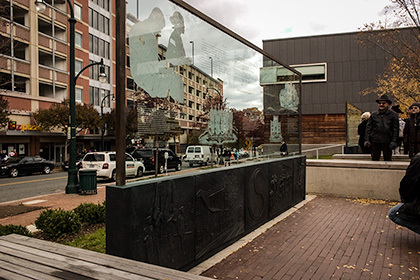 Classic Glass was honored to contribute its carved glass to compliment Mendez’s bronze sculptural reliefs and the memorial is a fitting final touch to the beautiful Veterans Plaza. If you happen to be in downtown Silver Spring, stop by and take a minute to reflect on the sacrifices that our military personnel make every day. Today the Classic Glass blog would like to showcase a stained glass art installation by resident artisan Rudi Waros. 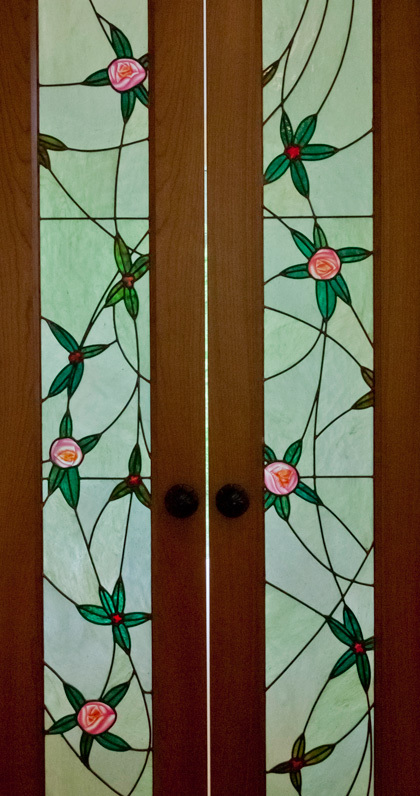 The inspiration for these stained glass art door-lights came from the existing art nouveau decor of the clients home in Bethesda, MD. Art Nouveau is French for “new art” and was popularized by Czech artist Alphonse Mucha in the late 19th Century. Its distinct influence can be found worldwide permeating all facets of decorative design including architectural, interior, furniture and jewelry design. This style is best characterized by its rhythmic pattern of curvy lines and organic subject matter such as flowers, leaves and vines. With the desired style established, Waros proceeded to design a stained glass work of art incorporating these elements, he also utilized a specific type of glass to convey the qualities of the art nouveau style. Because of its icy, wax like appearance, opalescent glass – “green stipple” was chosen for the background. Stipple glass is hand rolled by Youghiogheny Glass (pronounced YOKaGAYNEE) and is originally intended to recreate the look of certain Tiffany and Company lampshades. The soft qualities of stipple glass make this the perfect choice for representing the colors of art nouveau and its subtle texture is highlighted as light passes through it. Waros created the dimensional glass rose by using an etching technique to shade pink flash glass. He then applied a silver stain treatment that was finally kiln fired to achieve the flower’s orange center. The result is a handmade, one of a kind piece of art that really compliments the existing decor of the clients home. 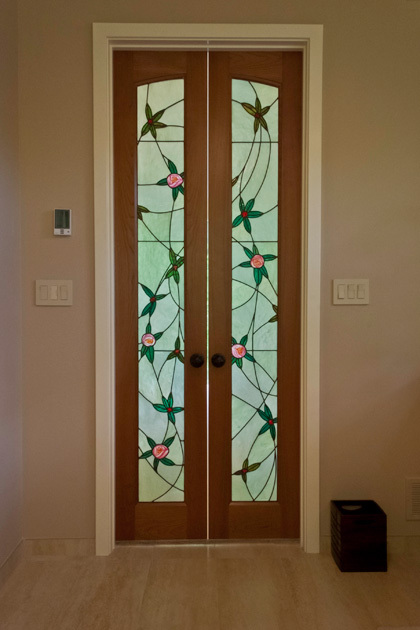 This stained glass art installation is a great example of the custom decorative glass that Classic Glass has been creating for over thirty years. Is there a door or window that you’ve always wanted to spruce up? Contact Classic Glass today to begin your own creative glass art journey! 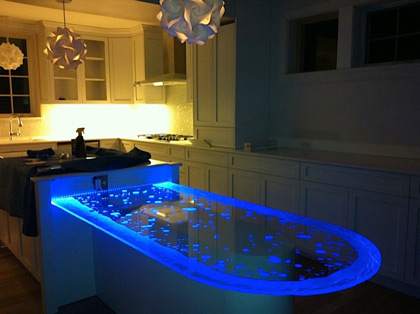 Our professional glass artists are always eager to turn your ideas into a reality. 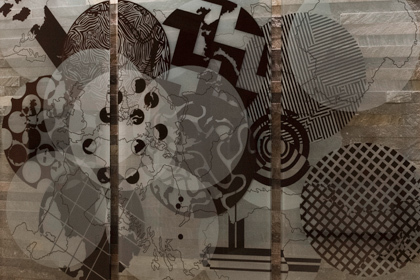 How do you take a 20″ x 16″ multi-layered ink drawing on transparent vellum and turn it into an 8′ x 7′ glass art triptych? 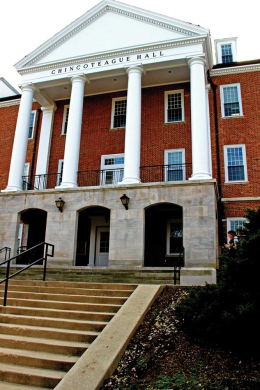 Classic Glass undertook this challenge and produced an impressive printed glass triptych that serves as the finishing touch on the $7 million renovation of the University of Maryland’s Chincoteague Hall in College Park, Maryland. The original art of Ruth Bowler titled "Overlap"
Classic Glass designer Jacob Robison’s challenge began with determining how to best capture the spirit of Bowler’s art while accurately depicting the transparent piece against a stone wall backdrop. Over several months, a variety of samples were developed and taken to Chincoteague Hall as Robison moved closer to an optimal solution. Original plans to etch the design proved ineffective in creating enough contrast to the stone wall. Carving the glass and infilling the design with paint also proved impractical as the complexity of the layered elements and interacting lines could not be achieved in a “clean” manner. Finally, because of the precise control of the technique, Robison determined that glass printing would create a high visual impact and provide the needed contrast to the stone backdrop. By directly printing on glass, the striking look and feel of Bowler’s original art was realized. 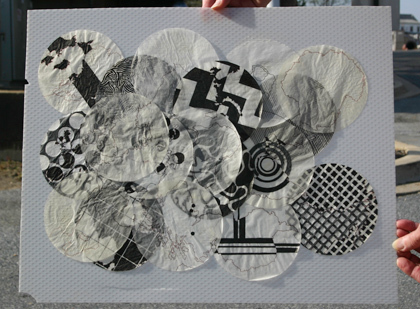 With glass printing as the chosen technique, Robison moved on to the challenge of recreating and enlarging Bowler’s artwork. Using advanced vector software, Robison meticulously recreated a precise high resolution version of the original ink design. Three double-paneled pieces of glass were selected to build the glass triptych. 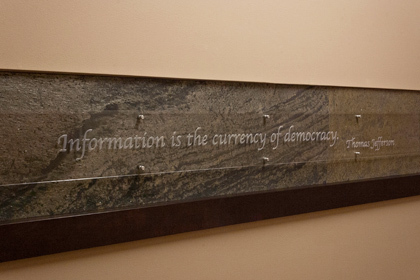 The art was then printed on the front and back surfaces of each sandwiched panel excluding the front lobby surface. This functional approach provides a smooth front surface and protects the ink from curious fingers. White ink was printed as a transparency on the glass to successfully recreate the overlay effect of the original vellum. Today, Egypt’s former President Anwar Sadat’s quests for peace greets visitors to Chincoteague Hall in the form of Classic Glass’s stunning representation of Bowler’s award-winning art. 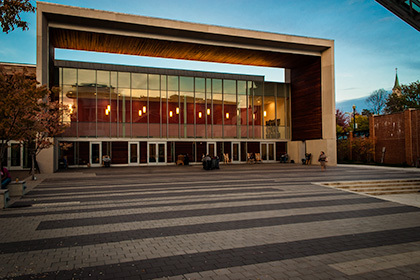 The newly-renovated hall will house the offices of the Baha’i Chair for World Peace, along with the university’s Sadat Chair for Peace and Development, and the George and Lisa Zakhem Kahlil Gibran Chair for Values and Peace. One of our most popular products, back-painted glass tile, is available in custom sizes and colors to match or accent your home or office. For the above installation, Classic Glass worked with architect and designer Mercedes Rivera Goetz to create a unique tile design that compliments the existing decor of this Arlington residence. Back-painted glass colors are custom mixed to match most Pantone, Sherwin Williams and Benjamin Moore color swatches. The inherent qualities of back painted glass offer sleek detail to any interior, and its ease of maintenance is very popular among clientele. 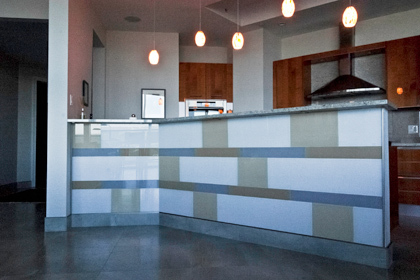 Back-painted glass tile as an architectural element can be used for walls and backsplashes and is a great choice for those seeking to modernize their space. 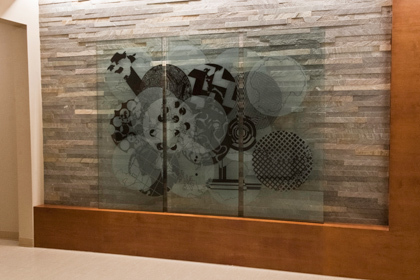 By combining deep carved glass with etched glass shading, Classic Glass artisans create stunning visuals that are both beautiful and sophisticated. This latest piece by glass artist Rudi Waros combines both techniques and is accented by an edge lit LED system. The client wished to capture the organic qualities of water and thus requested the carved glass’ edge mimic that of rippling waves. 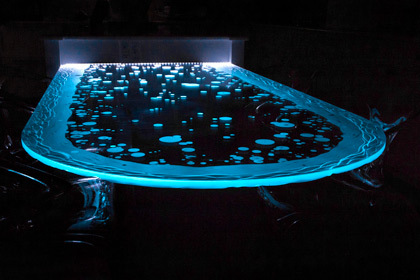 Moving in from the carved edge, soft etched shading fades into circular bubbles that disperse as they reach the table’s center. The carved relief is on the underside which allows the top side of the glass table to be smooth and functional. Incorporating relief carving with LED lighting produces dramatic illumination, contrast and vibrant color that washes through the glass. These powerful lights instantly accentuate carved glass, adding interest and personality. The controls allow the user to choose from a range of colors and even set the scheme for color fading or strobe like effects. The result is a work of art that highlights the overall design of the clients kitchen. Classic Glass artisans specialize in combining traditional glass techniques with modern technology to create truly unique works of art.